The Lockner Estate Residents Association represents the 210 homes living on the Lockner Estate situated between De Beauvoir and Dalston. We liaise with Hackney Council on behalf of the tenants and residents to ensure that Lockner is well looked after and a nice place to live for us all. We are very active socially and run events for residents regularily which help to achieve a great sense of community on Lockner. The Big Lunch 2011 at the Lockner Estate. The Big Lunch is a one day get-together for neighbours. It’s a nationwide campaign to get as many people as possible to have lunch together in a simple act of community, friendship and fun. This will be the third year that the Lockner Estate has had a Big Lunch. In our first year, we started off quite small – we had a barbeque out on the bit of green space between Dorchester, Dorset and Wareham Courts. Last year, we made a bit more of an effort. 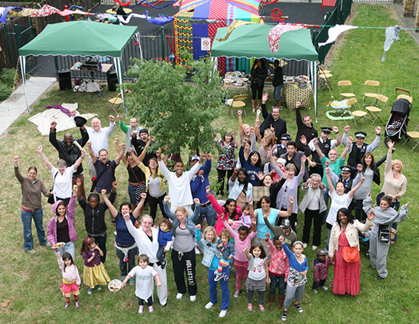 We organized an event which had home-made bunting and a children’s play tent, hand made by residents on the estate. We had live music, a dj, a raffle, a barbeque, a parkour workshop, a cycle surgery, a juice bar and much more. We asked neighbours to bring a dish, and gave a prize to the best dishes. Young people from the estate had their faces painted, and also helped us to plant a community seed garden, which is thriving. There’s a photo of estate residents planting the garden at the event on the homepage of this blog.